While the world cruise ship fleet continues to accept ever bigger ships into its inventory, the expansion in the market has also caused an interesting upturn in the number of new small ships that are being introduced as well. Cruising in small ships, while offering roughly the same experience in terms of being at sea, is an entirely different experience in almost all ways from cruising in a large ship. It is more like sailing in a yacht compared to an aircraft carrier. Gambling, shopping and games are no longer part of the formula, but adventure, learning and exploration are. Small ships offer a sociable experience in which one gets to know fellow passengers, and is closer to the sea and the surrounding environment without overwhelming the places at which these ships call. Seattle-based Cruise West got its start back to 1947, when the West family, under the late Chuck West, began offering Alaska cruises in three small ships operated by Union Steamships of Vancouver. So successful was this that in 1958 West bought two of the ships, formed Alaska Cruise Lines, and operated them for his own account as the Glacier Queen and the Yukon Star. 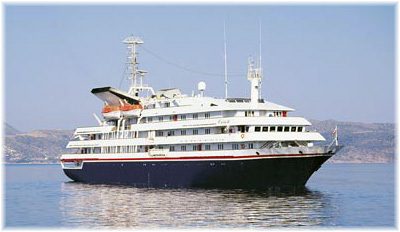 The third became Sun Line's Stella Maris, in the Greek Isles. After adding slightly larger and newer ships to the fleet, West eventually sold his Westours operation to Holland America Line in 1971 and they moved their headquarters to Seattle. Perhaps feeling idle, and not to be deterred by such a simple thing as selling his business, Chuck started again in 1973 as Alaska Sightseeing Tours. 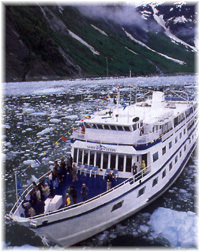 Eventually, he bought the 52-passenger Spirit of Glacier Bay in 1990 and built another fleet of small ships that is today called Cruise West. This includes nine ships carrying between 78 and 138 guests each, including the two-ship US-flag fleet of Clipper Cruise Lines, which they bought in 2006. All Cruise West ships are US-flag except for the 120-guest Spirit of Oceanus, which ranges the South Pacific and the Far East each winter, and the 100-guest Pacific Explorer, which cruises Costa Rica and the Panama Canal. The pre-eminent small ship operator, Cruise West has set the tone for the industry when others have not been able to survive. Next up in the small ship category, and founded in 1966 by the late Luther Blount, who owned a shipyard at Warren, Rhode Island, was American Canadian Line. 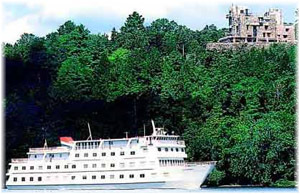 Starting with the small Mount Hope in 1969 and slightly larger New Shoreham in 1971, Blount began to offer cruises from Rhode Island all the way up the Hudson River and New York State Barge Canal into the lower Great Lakes and St Lawrence River as far as the Saguenay. Later, when he cruised down the Intracoastal Waterway and added winter cruises in the Bahamas and the Virgin Islands the line became known as American Canadian Caribbean Line. This line is known for its very low profile ships with retracting bridges, necessary to get under bridges along the barge canal, and their unique bow ramps that allow landing directly onto beaches. It is also known for not running any bars on its ships. Instead, guests bring their bottles and the line supplies the mix. Today's fleet consists of the 100-guest Grande Caribe and Grande Mariner and the 84-guest Niagara Prince and cruises are offered as far afield as Labrador and Newfoundland in the north and the Panama Canal and Venezuela's Orinoco River in the south. 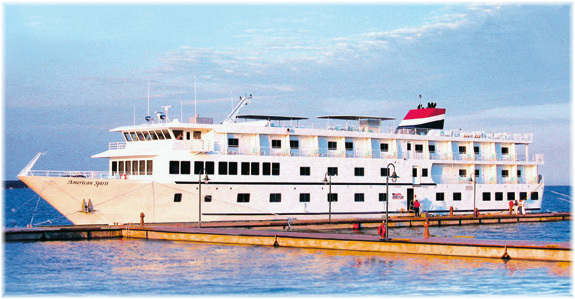 In its first incarnation, Connecticut-based American Cruise Lines started in 1974, building a fleet of six small US-flag coastal cruise ships before its owner sold the business. Unfortunately, in its first incarnation, ACL went out of business in 1988. However, starting again in 2000, Charles Robertson went on to build today's fleet of four luxury small ships. Starting with two 165-foot 49-guest ships, the American Eagle and American Glory, the fleet has most recently added two 220-foot 100-guest ships, the American Spirit and American Star, that offer a lot of space. Dining is one sitting and the staff are all-American and for followers of "homeland cruising," these ships never leave the United States, cruising between Charleston and Jacksonville and up Florida's St John's River in the wintertime. Perhaps more important however is the fact that they offer the largest small ship accommodations afloat and not the tiny tinny cabins of the early small ship days. Associated with ACL is Pearl Seas, which in essence is its offshore operation, with ships to be registered in the Marshall Islands. Establishing Pearl Seas has allowed ACL to build much larger ships outside the United States and operate them with lower costs. The line's first ship, the 335-foot 210-guest Pearl Mist, is now being completed in Halifax, Nova Scotia, and a second is planned, but where or when she will be built has not yet been announced. 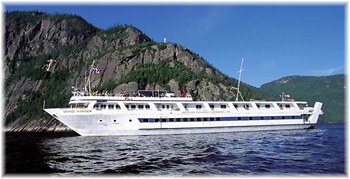 Unlike the ships of its US parent company, the Pearl Mist will cruise almost entirely in Eastern Canada, the Gulf of St Lawrence and the Great Lakes by summer and in the Caribbean by winter so there will be no duplication of itineraries. With staterooms ranging from 302 to 580 square feet, these will be the largest small ship staterooms afloat. Moreover, they will all have private verandas, the first small ships to offer this amenity. An interesting additional facility that many small ships now offer is a well-stocked library instead of a casino full of one-armed bandits. After the saga of the eight "R" Ships that now operate for Azamara, Oceania and Princess, many tend to forget that Renaissance Cruises had earlier launched another fleet of eight 114-guest luxury small ships. Built in two sets of four in two Italian shipyards, these ships had wonderful wood-panelled staterooms and were often used for full ship charters by organizations such as the Smithsonian Institution in Washington. Renaissance I - is now a gambling ship. Starting with the 289-foot 64-guest Le Ponant in 1991, adding the 328-foot 90-guest Le Levant in 1999 and acquiring the 407-foot 198-guest Le Diamant in 2004, Compagnie des Iles du Ponant has progressed to the point where it has now ordered two 466-foot 264-guest luxury small ships from Fincantieri. Today owned by the French Shipping company CMA CGM, the third largest container line in the world, Ponant is expanding to a five-ship fleet with a total of 800 berths. At 10,600 tons, the new ships will be a little larger than the original Seabourn ships but will feature verandas in 95% of their staterooms. To be named Le Boreal and L'Australe and delivered in 2010, the former will cruise the western Mediterranean, the Baltic, Iceland, the St Lawrence and Great Lakes, the Caribbean and the Amazon and will cruise Antarctica by winter. L'Australe, on the other hand, will cruise in the eastern Mediterranean, the Red Sea, India and Southeast Asia. Stateroom sizes will vary from a minimum of 200 square feet up to 301 square feet, but twenty deluxe suites of 398 square feet (plus balcony) will be possible by combining two standard staterooms and reconfiguring the space. A fairly recent change with this line has been its brand, at least in the non-French market, which from Compagnie des Iles du Ponant has become Ponant Cruises. This follows in the vein of Compagnie de Navigation Paquet, who before becoming part of Costa Cruises, had changed to Paquet Cruises. Top of the line in the small ship category must come Hebridean International, the Yachts of Seabourn and SeaDream Yacht Club, three entirely different experiences. 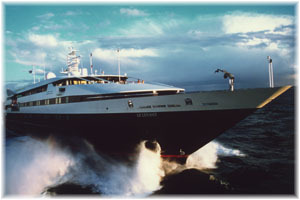 Hebridean is the cream of the crop and the most expensive cruise line around. Its 60-guest Hebridean Princess operates a country house experience, primarily in the Scottish Isles, while the 99-guest Hebridean Spirit operates further afield and often uses private chartered luxury jets to move its passengers to and from the ship. Seabourn's three first generation 440-foot ships, at around 10,000 tons, are limited to 212 guests. These ships are all-inclusive and offer a very upmarket experience for those who can afford it. But the line's latest ships will take them out of the category of small ships. SeaDream, meanwhile, operates the two original ultra-luxury 344-foot 110-guest Sea Goddess ships, which have been opened up with more deck space and a Top of the Yacht bar, as well as water sports. Their target audience is the 30-40-year-old crowd who seek an exclusive cruising experience and their 7-day itineraries allow this for those who are career-oriented and can't afford much more time. Down under, in Australia and Fiji, we have another set of small ship operators with Captain Cook Cruises and Coral Princess Cruises. Cruceros Australis have two ships, one acquisition and one newbuilding, cruising the Chilean fjords. 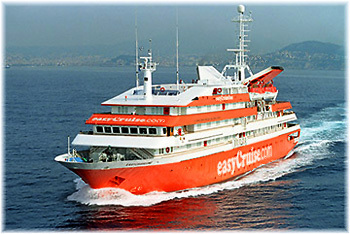 Elegant Cruises & Tours cruise the Adriatic and other waters. Yet more operators tour the Galapagos Islands. 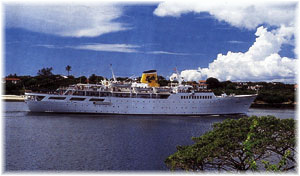 Indian Ocean Cruises operates from Mauritius. 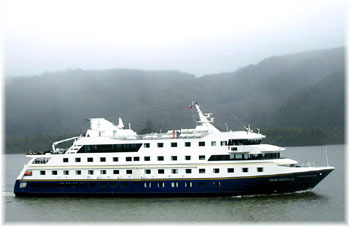 Lindblad National Geographic Expeditions operate two more small ships in Alaska. Variety Cruises tour the Greek Isles. And so on. The choice is wide, and this does not include river, sail or expedition cruises. The big question, however, is how will all these ships do in light of the recession? Some say that their client demographics are such that many of them are of an age where they will not suffer from recession, others that people may forgo a new car for a year but they still want their annual (or more frequent) cruise and that people who are used to small ships know that the fares are higher and are unlikely to want to trade down to a big ship for a cheaper fare. One big advantage of course is that the total number of berths in small ships accounts for only a very small part of the market, probably something like 2 or 3%. Nevertheless, within the past month African Safari Club's 367-foot 222-guest Royal Star has withdrawn from trading after eighteen years and others such as Mauritius Island Cruises (2004) and Glacier Bay Cruise Line (2005) are no longer with us, so consumers should be careful where and how they book in terms of protecting their moneys, especially in today's climate.